Bluff Park is a small, upscale neighborhood in Long Beach, California. There is a bluff along much of the beach in Long Beach, and on one stretch, there is the narrow Bluff Park from which the neighborhood gets its name. 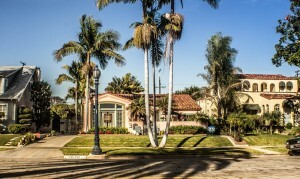 Bluff Park is the location of the Long Beach Museum of Art, as well as many older, well-maintained homes. There is also a Buddhist monastery that once was a Roman Catholic convent. The boundaries for the Bluff Park Historic District (founded in 1982) are defined as Ocean Boulevard on the south, Junipero Avenue of the west, a jagged line between 2nd St. and Broadway on the north, and Loma Avenue on the east. The community of Belmont Heights is to the east of Bluff Park, the community of Bluff Heights is to the north, and the community of Alamitos Beach is to the west. Bluff Park is a 25.8 acres (104,000 m2) park located between Ocean Blvd. and a tall bluff above the large sandy beach in the area. It is frequented by joggers, strollers, and dog walkers. Hobbyists with radio-controlled gliders like to use the natural updrafts of the bluff for their model planes. There is a replica of the Lone Sailor Statue in the park in honor of Long Beach’s Naval heritage.